Polo, Marco: De consuetudinibus et conditionibus orientalium regionum. 4to. a-h8 i4 k6. leaves. ISTC ip00902000; Goff P902; BMC IX 37; Bod-inc P-428. Dated from HPT II, 418; dated by Goff 1483-85. Translated into Latin from Italian ('Delle maravigliose cose del mondo'). Provenance: William Hunter (1718-1783), physician and anatomist: source unknown. University of Glasgow: Hunterian bequest 1807; Hunterian Museum bookplate on front pastedown, with former shelfmark “At.3.13”. Binding: Binding: 18th-century mottled calf decorated with triple gold fillets, a small gold ornament at each corner; gold-tooled spine; red-edged leaves. Size: 212 x 143 mm. Leaf size: 205 x 137 mm. 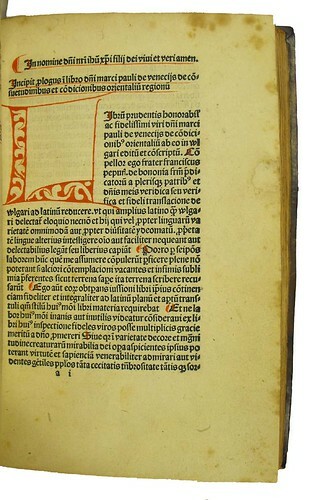 Decoration: Ten-line initial “L” on a1r supplied in red and reserved white; other initials, capital strokes, paragraph marks and underlining of chapter headings supplied in red.